Finish out the year by having fun connecting STEM to your Reading Lessons!! Connecting hands-on STEM activities with your weekly shared read can strengthen your students’ STEM understanding! 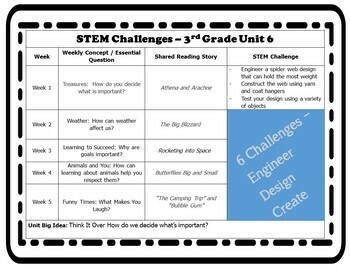 These weekly STEM challenges are sure to inspire inquiry and creativity! If you’ve been thinking about trying STEM lessons, this would be a great resource for easing you into the world of STEM. This download covers every week in Unit 5. It includes STEM challenge ideas for each week. You make the ideas your own! Versatile because you decide how to implement the challenge! STEM and reading go hand in hand! By integrating literacy and STEM, students become strong readers while exploring topics that they find engaging! You already do the weekly shared read, why not use that to inspire your student’s curiosity and creativity! Give STEM a try! Thank You For Your Purchase! I appreciate you! Today Is a Great Day to Learn Something New!